Zoe Lyons is a veteran of the UK comedy scene, building a reputation as an energetic, whipsmart MC who can also create animated hours full of intricate observations. Her latest Fringe show Mustard Cutter was among her most successful yet, and now she’s taking it to London at St James’ Studio. Mustard Cutter is coming to London this month. How do you describe the show? My latest stand up show has the loose theme of what is is to be better or attempt to make yourself better. My shows tend to be a mix of anecdotes, jokes and quite a lot of physicality. I am pretty animated on stage, I really enjoy acting out routines. It received a lot of critical acclaim at the Fringe last year. Did you enjoy the run? I probably had my best run yet at the Fringe last year. The Festival is a long old slog, four weeks of performing every day can be a bit stressful and you have to really like the show you are doing. I was really pleased how the run went, great audiences and nice reviews. I usually fully unravel by the time the Fringe draws to a close and lie in a darkened room with a cool cloth on my brow for a day or two. How do the themes in this hour compare to your previous work? I never like to heavily theme my shows, I find that a bit constricting. I have started to talk more about my own life and relationship in this show so in that respect it is a little more personal. You host a regular show in Brighton. How do the Brighton and London comedy circuits compare? 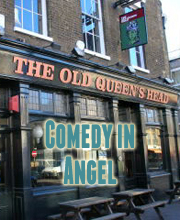 The London comedy scene is huge, probably the highest concentration of comedy gigs in the world. Comics can regularly do three gigs a night at the weekend in London. Brighton, of course, is a much smaller, more gentle scene. There are some lovely little gigs to try stuff out. There is more of a community feel and Brighton is such a creative hub it is no wonder it has produced so many great comics in the last few years. What’s next for you after you complete this run of Mustard Cutter? Writing a new show starts in earnest. There is that moment after a tour has finished when you realise you have to pretty much dump all that material and start from scratch. It is both terrifying and liberating at the same time….. But mostly terrifying.